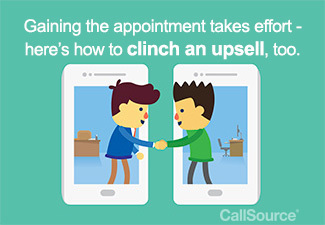 It may not always seem like the right timing to try to squeeze in an upsell when answering inbound calls, but if you follow the right steps, you can upsell like a pro. Learning the art of upselling to your customers can give you great challenges, if not done correctly. We all know that upselling can mean a great deal of revenue for your company, not only in direct sells but also in building customer trust for returning business. Often in my training and coaching sessions during my 14+ years as a call coach, I hear things like “I am not comfortable with upselling,” or “I feel like I sound too pushy!” As a good coach, I always ask, “why does it feel that way?” and the answer is almost always that the phone handlers don’t know if the customer needs it or wants it. And there it is. There is the answer to how to effectively upsell to your customer: get to know them! Getting to know your customer can be quick and effective with these simple tips. With an upbeat and curious tone, ask your customer open ended questions to get them to open up about their situation; questions starting with, who, what where, when why, how and tell me are open ended. These types of questions invite conversation and help you to determine the caller’s needs and other needs that maybe even the customer has not thought about. In order to have a meaningful conversation with the customer, you have to be actively listening by restating back their needs. Restating back the customer’s needs not only helps in clarifying, it builds trust with the customer as you want to get their needs correctly. You also get the customer to say “yes”! And remember, the more times you can get the customer to say “yes,” the more likely they will say “yes” when asking for their business! Now that you have a complete understanding on what the customer’s need are, you can make a confident, personalized recommendation of other products and services you offer. A personalized recommendation not only gives you the confidence to upsell, it also helps the customer to see the value of what you are offering and how it applies to them. Once they know how it applies to them or how it can help them, they will be more likely to buy the additional services you are offering. Remember: ask questions, listen to your customer and make a personalized recommendation and you will be on your way to more effective upselling in every call! Want more tips like these? Be sure to subscribe to our blog, or contact a CallSource Representative today to see how call coaching can benefit your business.